The higher education landscape was rocked last year when ITT Tech shuttered its doors after the Department of Education banned the for-profit college from accepting new students who depend on Federal student aid. The decision to shut down affected 35,000 students and 8,000 employees. The decision also gave way to greater discussions about for-profit colleges and higher education accreditation. Students, especially first-generation college students, frequently struggle in determining which colleges can help advance their careers and which offer degrees that mean nothing to employers. This is especially difficult in the distance learning and technical college markets where determining a degree mill from a legitimate institution of higher education is even more difficult. Students and their families are often ill-equipped and unfamiliar with the world of accreditation and cannot easily determine whether a school is accredited, or if the accrediting body is legitimate. In order to improve transparency in the higher ed space, the U.S. Department of Education’s Office of Postsecondary Education launched a new database that helps users understand the accreditation status of higher education institutions across the country. 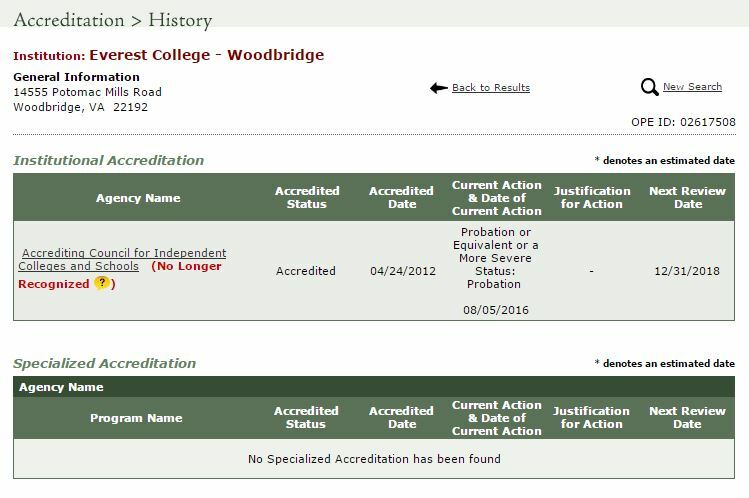 With the database–named the Database of Accredited Postsecondary Institutions and Programs–users can search by accreditation agency or by the institution for higher education. The database shows not only accreditation of the institution as a whole, but also specific degree or program-level accreditation. It provides the accreditation agency’s name, the accreditation status, what date the accreditation was granted, and the next review date. In instances where accreditation wasn’t granted fully or was revoked, the database shows current actions facing the university and the justification for that action. Users can also search for the accreditation status for internships and residency programs on the database. However, equipping students with information regarding accreditation status isn’t always enough. In the United States, there are numerous accreditation agencies and not all are created equal. The database includes only information about accreditation agencies that are either currently recognized by the Department of Education or were at one time recognized. This decision was likely due to the vast number of unrecognized accreditation agencies in the country. The Education Department notes that the database’s information is reported by recognized accrediting agencies and state approval agencies that have been asked to provide information for each institution and/or program accredited by that agency. The department does note that the information is not audited and should not be viewed as an endorsement, nor does the information come with a warranty of any kind.